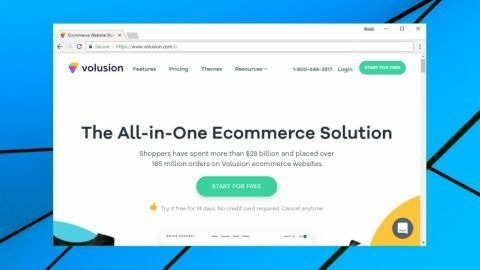 Volusion is a capable and user-friendly web store builder, but it’s a little expensive for what you get. Volusion is a comprehensive e-commerce solution which includes a highly customizable web store, integrated SEO management and even a CRM system. Despite the high-end functionality, Volusion gets you off to a gentle start with a small but appealing set of responsive themes (check out a full site demo of the Craft theme here). These provide everything you need for a simple store, but a capable WYSIWYG site builder enables customizing your site by adding content blocks for image galleries, videos, testimonials, social media and more. A sophisticated product catalog supports illustrating your offerings with photos, videos and rich text descriptions. You're able to build up a searchable knowledgebase to help customers choose the right product for them, and features like user reviews and a Related Product system should also point them in the right direction. The good news continues with comprehensive shipping and tax rules, payment processing via credit cards, Amazon Pay, cash, wire payment, PayPal, Stripe, electronic checks and money orders, and a simple inventory management system is on hand to let you know when stocks are running low. Elsewhere, the ability to manage site metadata keeps your store SEO-friendly. Experts will appreciate tools like the sitemap indexing and customizable robots.txt file. Marketing tools include gift card and discount schemes, and premium Volusion plans allow you to sell on Facebook, Amazon, eBay and more. Volusion pricing starts at $15 (£10.71) a month for the Mini plan, which gets you support for 100 products and a miserly 1GB a month bandwidth (data transfer leaving the website). Use too much bandwidth and you're charged a chunky overage fee of $7 (£5) per GB. The $35 (£25) a month Plus plan can handle 1,000 products and 3GB of bandwidth, as well as throwing in some very valuable new features: newsletters, a ratings and reviews system, abandoned cart reports and telephone support. The best value plan is probably the $75 (£53.57) a month Pro offering, which allows using 10,000 products, has 10GB bandwidth, and adds eBay and Amazon integration, phone order support plus a CRM, a 'Deal of the Day' system and a customer loyalty scheme. Whatever option you prefer, keep in mind that SSL certificates aren't included. There's a $99 (£70.71) fee to transfer any certificate you have already, so it probably makes more financial sense to purchase one of Volusion's own. There's a range available and prices start at $89 (£63.57) for one year, or $149 (£106.43) for two. Volusion does have one pricing plus - no transaction fees - but otherwise it looks a little expensive. Still, the company does at least offer a free 14-day trial with no credit card details required, so there's no risk in checking the service out. Getting started with Volusion is a little easier than you'll see with most of the competition. One click on the Start button, hand over your details in a relatively short form - name, email address, country and phone number - and your account is activated almost immediately. Volusion's workflow feels a little more natural, too. You're not dumped at a bulky web management console and left to figure out what to do next, as happens with services such as BigCommerce or Shopify. Instead, Volusion acts more like a conventional website builder, displaying its theme browser and allowing you to preview and choose a template which suits your needs. Volusion's well-designed dashboard is also more straightforward than you'll see with many competitors. A menu bar enables jumping straight to key function areas - Orders, Customers, Inventory, Marketing, Design, Reports - but the bulk of the screen is set up to be as welcoming as possible. There's advice on the steps to take next, some helpful video tutorials, links to support resources or live chat, even a customizable to-do list. Conveniently, Volusion also displays basic reports directly on its main dashboard, with charts showing recent orders, top products, top product categories, bandwidth usage and more. These use sample data until you make your first sale, enabling you to see how they'll work from the first time you log in. Volusion's initial dashboard view prompts you to take four startup steps: choose a template, upload your logo, add products and select a plan to start selling. The reality is a little more complex than this, but it's still a reassuringly simple way to begin. Clicking Select Template displays Volusion's template browser. There are some good quality themes available, and you get a reasonable choice with 11 free options and 39 priced at $180 (£129). Volusion presents users with 'Add Logo' as a step on its own, which seems like overkill to us (other services bury it as a customization detail somewhere). The company is a little more flexible than some, with the ability to create a text logo or upload an image, but mostly it seems Volusion is hoping you'll click a referral link which redirects you to Logojoy (a commercial logo creator). Next up, you're prompted to add your items. An Import option allows importing your product catalog from other platforms, at least in theory. You get no control over the import operation and you can't remap fields in the source CSV to specific Volusion item attributes. The source file must match Volusion's required format for the import to work. The tools to add and edit products manually are more interesting. Volusion's product description tools are relatively basic - just the usual formatted text, images and (optionally) embedded videos - but you also get a stack of options covering SEO, pricing, shipping, stock handling, third-party integrations, and more. Just browsing the Miscellaneous tab reveals some handy options. You're able to define some products as accessories to others, for instance, so that they're linked from the same page. You can design your own reward points scheme by giving different numbers of points to various products. Setting a Popularity score helps you define what will appear at the top of the list when customers sort your inventory, and you can optionally have a manufacturer logo displayed alongside the main product image. Volusion offers its own Volusion Payments scheme for taking credit card payments. This has a 2.15% transaction rate and 'low monthly fees', but it's only available in the US. If that's not right for you, other gateways with built-in support include Stripe, Digital River, NetBanx, Sage Pay, Realex, Skrill and WorldPay. You'll find PayPal tucked away on the More Payment Types tab, along with Wire Transfer, Money Order, Cash on Delivery, Purchase Order Number and more. Put it all together, and although Volusion can't match competitors such as BigCommerce for raw power, there's plenty to like here, and for the most part the service makes it easy to get your store up and running. Designing your online presence is just the start - any good e-commerce platform must also provide the tools you need to manage your new business. Volusion helps you track and manage your products via a strong set of shipping and inventory tools. You're able to create multiple warehouses and refer to any product by its location, aisle, bin and an optional custom ID. You can define 'low stock' alerts and set reorder quantities, and even set multiple vendor rules to automatically reorder or drop-ship your chosen products. Reports are available, both as dashboard summaries and in a more customizable form, but there are only a few options, and other services typically offer much more detail. Volusion doesn't include a built-in blog, unfortunately. The best the documentation can do is recommend you create a blog elsewhere, set up your domain DNS records to add it a subdomain, and manually link to it via custom HTML, hardly a professional solution for a web store. Volusion can integrate with assorted third-party services, and its Marketplace has apps which connect you to PayPal, ShipStation, Facebook Messenger, Amazon Pay, MailChimp and more. But there are only 69 apps available, a fraction of what you'll get with BigCommerce (600+) and Shopify (2,000+), and the integrations can take more work to set up. There are one or two surprising low-level features. In particular, an IP Firewall enables blocking ranges of IP addresses to your store or just the admin area, as well as limiting the number of failed transactions that can be made from an individual IP address per day. If you have trouble with any of this, Volusion's capable web knowledgebase provides a lot of articles covering everything from the newbie basics to developer-oriented API details. It's also useful for prospective customers as you can check out Volusion's workflow before you buy - take a look here. Not enough? Volusion also offers 24/7 support, an important feature you won't always get elsewhere (competitor UltraCart manages just 9.5/5, for example). We tried the live chat, and although the system warned we might not get a response for 20 minutes, an agent arrived in less than 10 and quickly solved our problem. Volusion isn't the cheapest e-commerce platform around, but if your store is broken and you need some help, that level of speedy support might justify the price. A likeable service, easy to use and with good support, but competitors like Shopify and BigCommerce generally give you more features for a lower price.